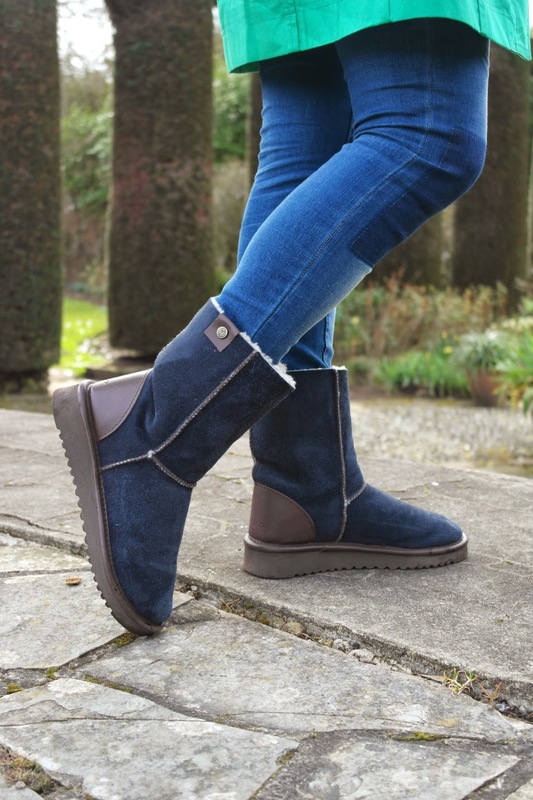 You may remember that I blogged about my ugg-style boots back in January but as part of my research into other sheepskin boot alternatives, I found out that there is a British company making ethically sourced sheepskin boots in Cornwall. 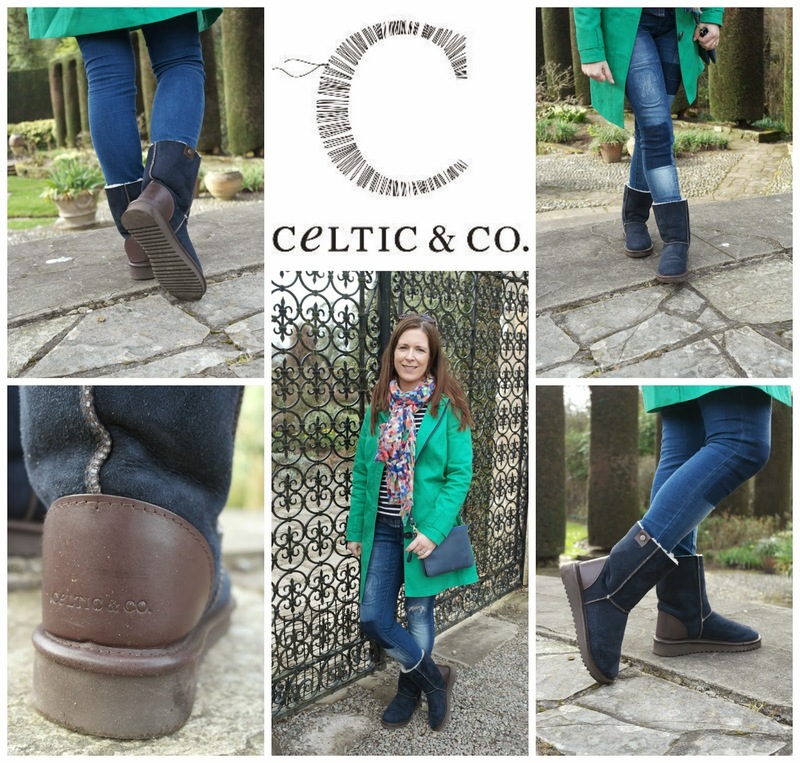 Emma from Celtic & Co got in touch with me shortly after I blogged about my other boots and told me about their Original Celt Boot, which is made from finest quality British sheepskin. It wasn't just the fact that these are made in Britain but these sheepskin boots are fashion with a clear conscience - the skins Celtic & Co use to manufacture their sheepskin footwear are predominantly from British sheep, with a very small proportion coming from Europe & they are always a by-product of the UK & European farming industry which operate within the highest regulations for animal welfare. So I wore them today to Mount Stewart along with a bit of green for St Patrick's Day and I can vouch for their comfort and warmth. They also feel much more sturdy than my other boots - definitely better suited to day-time, outdoors wear. The shorter style is also more flattering to wear and perfect year round. It was a lovely day down on the Ards Penninsula - really felt like spring and I couldn't believe how many flowers were out in full bloom. Mountstewart has it's own micro-climate so it is weeks ahead of most other gardens over here. 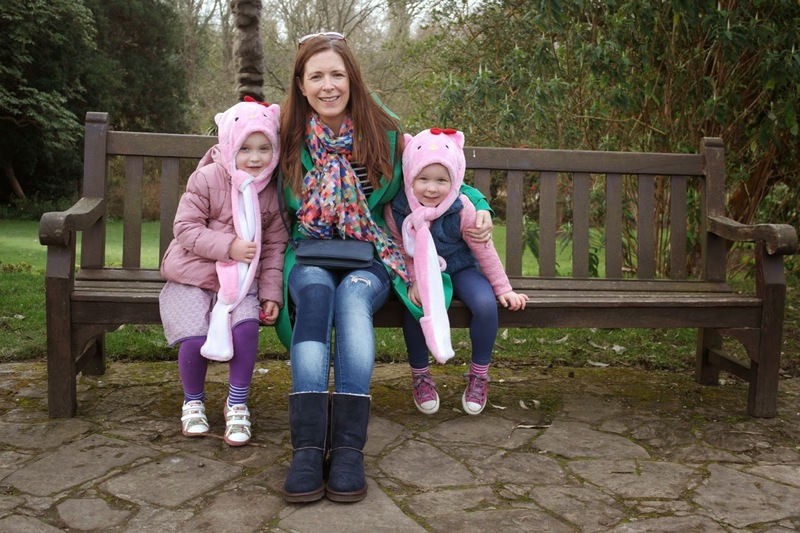 Love this shot of me and my Hello Kitty girls hanging out in the gardens.. Linking up today with Very Busy Mama for #realmomstyle. 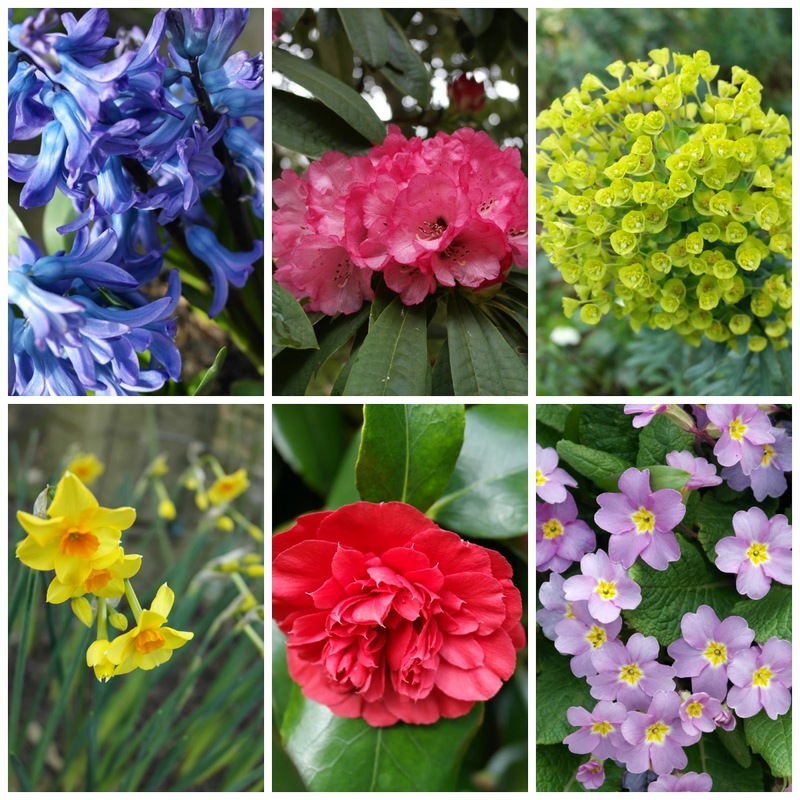 Do have a look on Maria-Jose's blog post to see all the other mums taking part and if you're a blogger, you can add your link too. Oh and an #OperationFormalDress update - my gifted dress hasn't arrived yet and there's NO post today because it's a Bank Holiday over here - SOB. Fingers crossed it will arrive tomorrow. But thank you to everyone who has gotten in touch to offer dresses. Love you all! Oooh love these boots. Navy is a much more flattering colour! Love ur cosy & chic essemble(colorwise it's gr8 too:)! Cute outfit I love the green trench and those jeans are great. You look FAB! My friend has boots from this company and she raves about them. Fab boots Avril & I love the colour of your mac teamed with navy. Ye gotta love a navy boot especially a comfy one like those look! 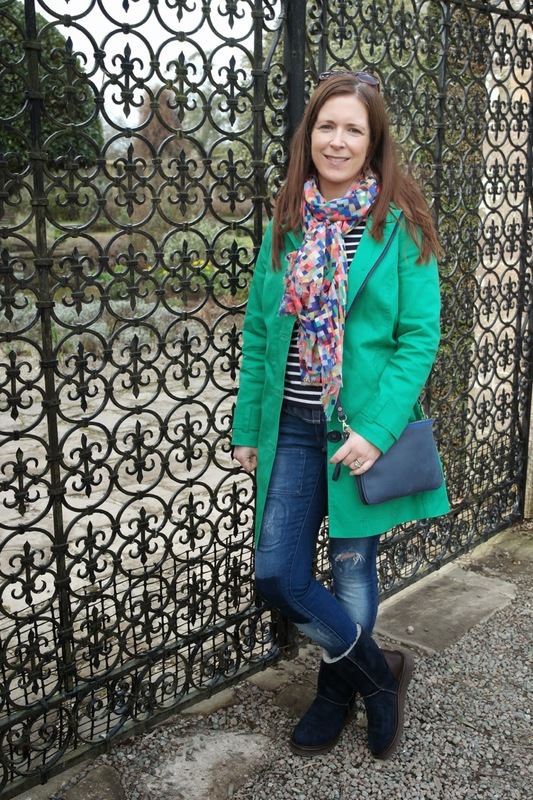 Loving the coat, very patriotic indeed, early went for a similar look myself today, I have the same jeans scarf and top and we almost went to Mountstewart- so that would have been a bit awkward! Love those boots Avril, great colour and I like the fact they are ethically made, that is a big pull these days. Am I going mad I swear I commented on a glittery shoe post of yours? 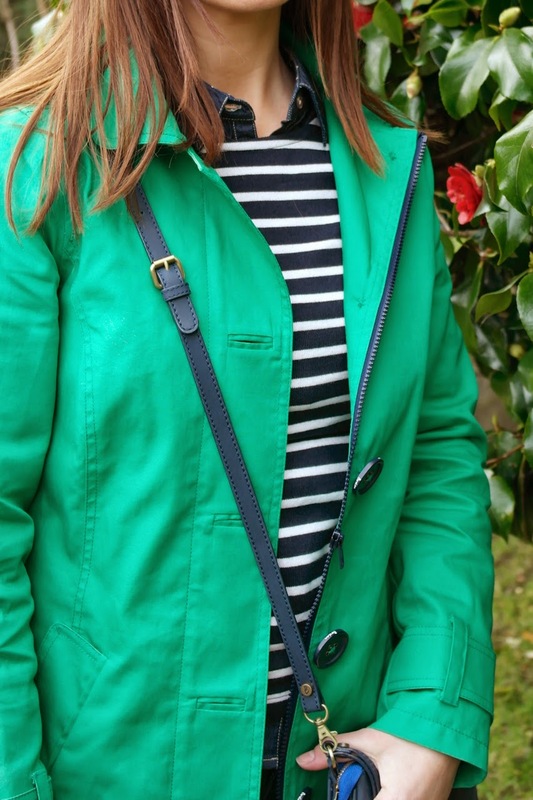 That bright green coat is the perfect way to bring some color to a dreary rainy day! Love! Love love those boots, will deffo have a look at them when I come to replace my uggs this year. Navy is so unusual. We would have boiled in them here though, can't believe the difference in the weather! Fabulous picture of you and the girls!! You totally look amazing in green - sets off your hair color perfectly. I'm quite happy St. Patrick's is over I'm afraid - it's bedlam here - I'll never fully understand it! Thank you for linkin in with Real Mom STyle. Love these, buying local sheepskin option is not only great for the local economy, but often cheaper too because there is less of a brand name recognition markup.